There are plenty of WWE superstars who are bigger than life these days, but few have taken the fandom by storm like The Man Becky Lynch. The Lass Kicker has become the center of the biggest storyline at the moment involving Charlotte Flair and Ronda Rousey as they prepare for a huge match at WrestleMania, so it seems fitting that the fan favorite superstar is finally getting a much deserved Funko POP. Now we've got our first look at the new POP and all the details on how you can add The Man to your WWE collection. The Becky Lynch Funko POP is an Amazon exclusive, and features her half braided hairstyle she's rocking at the moment as well as her The Man shirt and attire. She's rocking a pose that perfectly captures her attitude in the ring, and she's up for pre-order now right here for $10.99. You can check out the official description of Funko's Becky Lynch POP below. 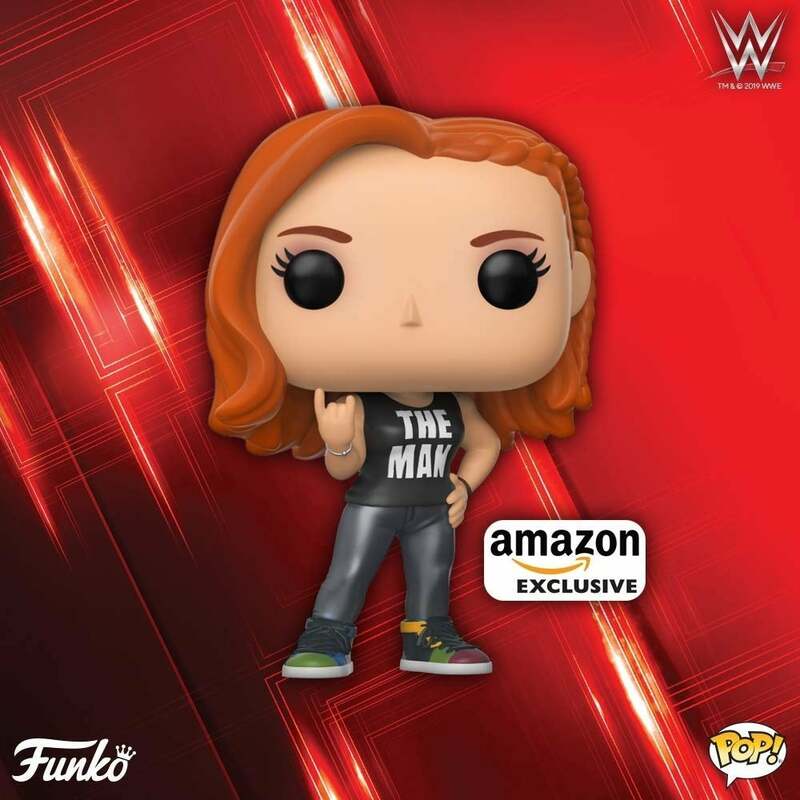 "WWe Superstar, The Man, Becky Lynch, as an exclusive pop! Vinyl from Funko. The long awaited debut of Becky Lynch in pop! Format is finally here, Just in time for the road to wrestlemania! This pop! Features the Irish "lass-kicker" As a 3. 75 inch figure in her iconic, The Man shirt. The pop! Comes in a window box display. Make sure to secure yours today, and be sure to check out the other WWE figures by Funko. Collect them all!" Becky Lynch is the final of the Four Horsewomen to get her own POP. Sasha Banks was the first, while Bayley followed as a Toy "R" Us exclusive (better times). Charlotte Flair recently made her debut in the line with the latest wave, coming in a regular version and a Foot Locker exclusive version. Now the set is complete, though we also hope to get at least one Becky Lynch variant as well, as she's gone through a few different looks on her way to the top. Lynch's opponent at WrestleMania Ronda Rousey also recently received the Funko POP treatment, though that POP isn't out just yet. There are plenty of other superstars that WWE and Funko can rollout of course. Many would love to see POP versions of Natalya, Carmella, Finn Balor, Baron Corbin, Naomi, Ricochet, Aleister Black, and more.